Create a luxe statement that will have all eyes on you with silk business cards. Make sure your customers and clients take notice of what you and your company represent. Use these to promote your personal or company business. These also work as durable flashcards or make for an impressive event giveaway. So step up your game and explore the many possibilities of silk laminated card printing. So really, there’s no way your business card will get damaged before the person you gave it to uses it to contact you. Silk Laminate Coating. Silk business card printing features a laminate coating on each side. This finish gives a polished look and a high-end tactile feel. It also adds a layer of durability that extends the life of your business card. The silk laminate will not stick together and is writable. Optional Spot UV Coating. Add some spot UV design accents for a beautiful visual and tactile contrast that lets your business card really shine. Silk laminated business cards come in various sizes but the most popular one is the standard 2” x 3.5” business card size. It’s small enough to hold in your pocket or wallet but has enough space for all your important information. A square edge shows off a classic, time-tested look that is perfect for more traditional use. It also looks more finished and refined. The sharp corners also give a serious, no-nonsense attitude that will work well for professionals or in the corporate world. A rounded edge is the hip, younger cousin of the square edge. This is perfect for more artistic, casual, or unconventional use. The rounded edges also help prevent snagging and dents, which is a common issue for square corners. Leave your customers on a high when your present them with silk business card printing. Why should I choose 16 pt. cardstock for business cards? A 16 pt. cardstock is thicker than the standard 14 pt. The added thickness is sturdier and can take on a little more handling abuse than thinner cardstocks. This makes it a great material for business cards and postcards. How long will it take for my business cards to arrive? You can base the arrival of your silk business cards on your “printing turnaround” and shipping time, which are two separate things. “Printing turnaround” is the number of days allotted for producing your order. This begins once you’ve uploaded your approved design online. The number of days does not include weekends, holidays or shipping time. What is a “Spot UV coating”? 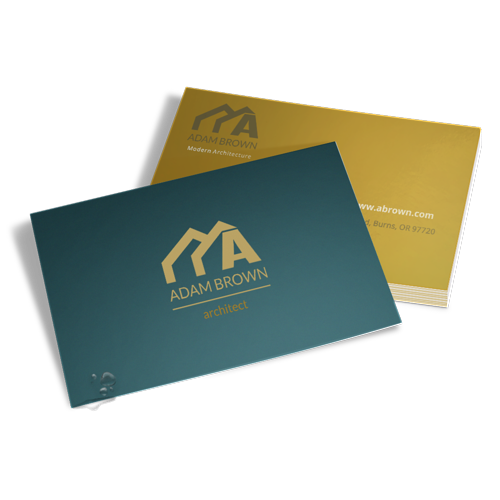 “Spot UV” is a clear glossy coating that is applied over a specific area on your business card surface. This gives a shiny, wet appearance that enhances the colors of your silk business card print. It is not writeable like matte or aqueous coatings.